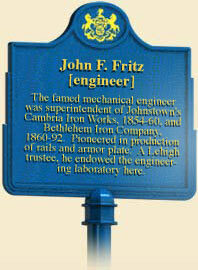 John Fritz led a remarkable group of pioneers in iron and steel technology. Together they built the nation's iron and steel industry and laid the groundwork for modern professional engineering. For a time they all tromped the streets of Johnstown.There at Cambria Iron Fritz built the country's first "three-high" rail rolling mill. 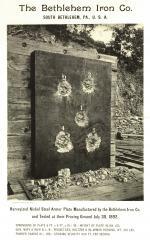 There, too, his talented brother George devised a blooming mill that, together with the three-high rail mill, took an eight-inch square ingot of Bessemer steel and rolled it into a perfectly shaped, thirty-foot-long rail. Cambria's Robert Hunt was the steel industry's first in-house chemist. Moving from Johnstown to Pittsburgh, Captain Bill Jones created modern hard-driving Bessemer practice, which made Andrew Carnegie fantastically rich. 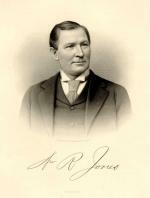 Alexander Holley, the foremost mechanical engineer of the age, visited Johnstown regularly. Early on, crazy William Kelly had held forth with his ideas on making steel. As even Carnegie acknowledged, "The Cambria Works produced more great steelmakers than any other works in the United States." Fritz stood at a transition in professional engineering. Raised on a farm in Chester County, and apprenticed to a blacksmith, Fritz had little formal education himself. His technical knowledge came from his direct experience - and from his "fraternal relationship" with Holley, Jones, Hunt and others. "We met as a band of loving brother engineers trained by arduous experience, young, able, energetic, and determined to make a success . . .. What each of us knew was common to us all," he affirmed. 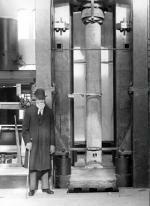 John Fritz standing beside the 800,000 pound Riehle testing machine, 1909. At Bethlehem in the 1870s, Fritz and Holley worked side-by-side to make the Bessemer process there a success. Then, when it became clear that no one could compete with Andrew Carnegie's brand-new Bessemer plant - designed by Holley and managed by Captain Jones - Fritz took Bethlehem into an entirely new field. Forging huge slabs of armor plate for the nation's new steel navy brought Bethlehem and Fritz to the forefront once again. While rails sold for less than $40 a ton, battleship armor sold more than $400 a ton. For these achievements Fritz was hailed by Frederick Taylor (with his own pretensions as a new "scientific" engineer in mind) as "one of the greatest and one of the last" of the "school of empirical engineers." In the twenty years after his retirement from Bethlehem in 1892, Fritz received numerous honors and awards including the much-celebrated Bessemer Medal. He served as president of both the American Institute of Mining Engineers and the American Society of Mechanical Engineers; he was the first recipient of the John Fritz medal awarded by the five principal American engineering societies. A trustee of Lehigh University for many years, he gave $50,000 to build the Fritz Engineering Laboratory and an additional $150,000 to maintain it. In good health throughout his long life, Fritz suffered an infected chest abscess that required an operation in the winter of 1912. Hearing a small blast of chloride of ethyl before the operation, Fritz reportedly said: "Doctor, that sound reminds me of my first Bessemer blow!" John Fritz, The Autobiography of John Fritz (New York: Wiley), 1912. Lance Metz, John Fritz: His Role in the Development of the American Iron and Steel Industry and His Legacy to the Bethlehem Community (Easton, PA: Center for Canal History and Technology), 1987.